Aalayam - Colors, Cuisines and Cultures Inspired! : Home Tour - An ode to Southern Hospitality! Home Tour - An ode to Southern Hospitality! I am fortunate to have many favorite "home away from homes" here in the USA, far away from my own parents' and friends' home in namma Bengalooru. An escape... a place where I can just be, without having to "run the house", but just relish in the receiving end of thoughtful pampering and scrumptious good food! Waking up in the morning to the smell of freshly brewing coffee..and mouth watering South-Indian tiffin... sitting in my pajamas until I have to get ready to go shopping or to the spa or some such indulgent endeavor instead of rushing to work with vestiges of a hastily eaten breakfast, if any!!!! You see, when we immigrate, we make USA our home, we develop networks of friends and extended families here, and it becomes an imperative fall back, a much needed retreat, in the chaotic, corporate, stir-crazy worlds we live in! And a retreat it was, with my lovely friends - Ashok, Anitha, and their kindergartner Abi. Not to forget their rollicking chocolate lab Ginger! Ashok and Anitha have just welcomed their second baby into this world, and are delightfully giddy with their new arrival! So, join me Aalayam family, in congratulating this lovely couple who opened up their hospitality to me.... to Aalayam, and shared their gorgeous Southern home replete with the modern Texan charm!!! As with most homes in Texas, the most striking feature of Ashok and Ani's home is its gorgeous high ceilinged architecture. While this style of construction can be a design intimidation for some, the home owners have embraced this feature and played it to their advantage. The Texas sun streams into their family room which has this gorgeous showcase fireplace feature, rendered even warmer with the spicy cinnamon color splash on the wall! Ornate Tanjore paintings and brass artifacts in shadow boxes adorn the feature wall that reflects the rippling sunshine and add an elegant grace to this home. Many of these vintage, much loved pieces are gifts from family and friends and have found a pride of place in this beautiful Texas home. Its rare to find tufted leather seating in a warm and cozy living space, much less, an Indian living room. Leather always evokes images of sleek, sophisticated and modern and cold, yet, the homeowners get the balance of chic classy and warm classic just right! The chocolate brown sofa adds that gorgeous neutral grounding to the earth tones sprinkled all over this living room! And of course their island kitchen is a dream one for me! Large and spacious, with a tons of above and below counter storage, it's the perfect hub for family dinner preparations, conversations and baking projects. The kitchen veers off to a sunny, informal dining area which the homeowners use for eating, homework, and other daily, comforting activities young parents indulge in with their children! (Read messy crafts, endless drawings, puzzles..midnight milk and cookies..and endless coffee and doughnut conversations!) And how easy is it to clean up messes on the lovely, cool stone floors? Thank Heavens for some small favors. 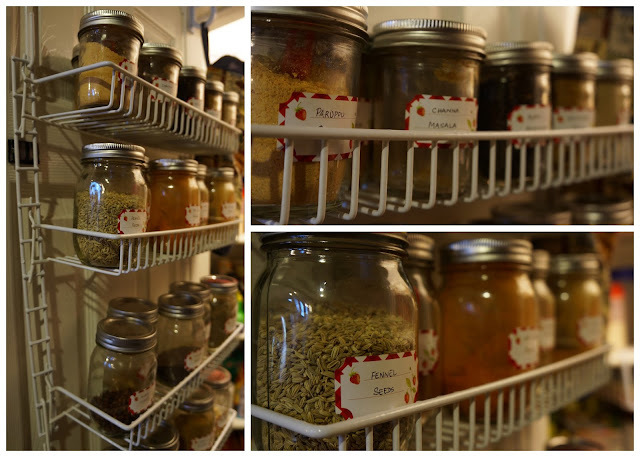 I had to sneak peek into Ani's pantry and share this quirky and functional spice box arrangement. Isn't it so cute that all the spices are labeled in Ani's neat handwriting? This spice box medley pays perfect homage to Ani's neat and organized lifestyle. Now, get ready to get transported into a modern seaside retreat in the middle of suburban Austin! This gorgeous master bed room has been hand painted by Ashok and Ani with painstaking precision. Can you think of how many things could go wrong while painting stripes on a textured wall? Yet the room looks lovely - modern, sophisticated and classy with metallic accents and subtle seaside themed decor. Just the perfect retreat for the home owners! I heard most Texas homes have their master bed room on the first floor. These Texas birds don't have to fly high to find their nest, do they! Just off the master bed, is the mocha colored staircase for the second floor. The colors around the home are perfectly complimentary to each other. Never too overwhelming, never too dull. Just perfect. Upstairs is a visual treat. A cute little kids room which Ani is planning to remodel for the new baby and her big brother! Ani, please share with us the picture of the new room when it is ready! We are curious to see how the lil nest turns out, after all our design pow-wows! Ashok is a movie buff. And a tech geek. 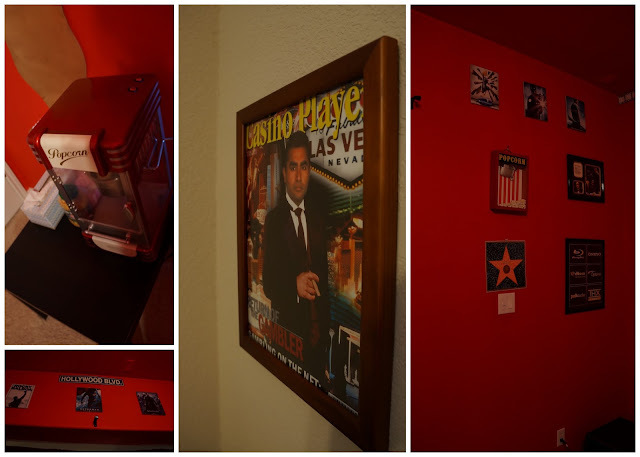 He is also the coolest guy to visit because he has a larger than life, home theater media room setup upstairs, done up in fire engine red, replete with sound masking curtains, digital dolby sound, Hollywood themed trivia, dozens of Blu Ray discs and accouterments thrown in for good measure! Aah, to recline in those chairs with a big bag of popcorn and be lost in a true-blue Indian movie! Sheer "home away from home" nirvana! This vintage box office style media room is a design inspiration, and a superb personal stamp the home owners have brought into this modern Texas home. I can easily imagine hiding out in this media room doing movie marathons after a stressful work week! The guest room gets some design love too! Coffee and Gold colored accents are interspersed with teal blue...A never fail combination. My favorite part of the room is the vines that start from the window, looking like a real branch has made its way through the window into the room! Finally, the perfect topping to Ashok and Ani's hospitality, is how they appealed to my gastronomic cravings at all times of the day! Did you know Ashok brews his own lattes and cappuccinos? He has a dreamy coffee machine which he put to delicious use during my visit there. I almost wept to leave that java junction behind! Now, I leave you with an image of succulent Texas mangoes topped with French Vanilla Ice Cream! I added crumbles of Krispy Kreme Original Glazed doughnut into mine... Pure and Simple Dessert Heaven!! Thank you guys for letting us into your home! Soon your beautiful home will be bustling with the patter of lil anklet clad feet...Congratulations once again! With lots of warm tidings from the Aalayam family! Ashok and Anitha! Thank you for your lovely hospitality, love and for the yummy food!! :) Cannot wait to vacation with you again! Lovely home, perfect for the lovely people. Thanks guys for your friendship. I missed being there this time. Thank you Sounding Board!! We missed having you around as well. What say we plan a vacation together sometime soon? Lovely people make lovely homes! Great post on one of my favourite vacation homes in the US !! Indeed ASHMAN! I totally second Ramya's philosophy - Remarkable people make remarkable homes!!! Ramya, I cannot wait to meet you next. Thank you once again for the lovely hand made necklace you made for me. I am wearing it almost every week to work. I would love to work with you sometime! U bet Mallika! Its the perfect urban getaway! And the hosts are stellar too. Thank u for stopping by!